Coal seam gas (CSG) and coal mine plans are becoming major issues in the upcoming New South Wales election on 28 March, as the State Government cancels a string of CSG exploration licenses and delays decisions on controversial new coal mines until after the election. The issues are becoming battles in marginal seats across the state as politicians rush to placate the locals in the face of growing resistance to coal and gas projects. The Government’s “Gas Plan” includes a freeze on processing applications for new CSG exploration licenses, and cancelling dozens of licences for CSG companies, but they’re largely not in areas with major CSG resources. Labor Opposition Leader Luke Foley has promised a state-wide moratorium on CSG (although it granted many of the licences now being revoked) and a full ban in the Northern Rivers region and drinking water catchments, while the Greens want a complete and permanent ban on CSG. The expansion of coal has been called a “dangerous” political issue, with former NSW Governor Dame Marie Bashir the latest to join the call to save farmland from coal mines. Battle lines are also being drawn over a $1.2 billion coal mine proposal by China’s Shenhua Watermark Coal, on the edge of the Liverpool plains, threatening the seat of a Nationals MP. The mine has kicked off the “water trigger rule”, causing Federal Environment Minister Greg Hunt to “stop the clock” on the decision. The controversial Wallarah 2 coal mine that the previous NSW Premier Barry O’Farrell promised to stop before the last election, and which Labor has promised now to prevent, has now gained preliminary approval from the Planning Advisory Commission (PAC), but protests are also gearing up there. The PAC has also approved the extension of a Rio Tinto coal mine in the Hunter Valley, recommending that the entire village of Bulga be relocated. The villagers have responded with a peaceful resistance pledge that has already been signed by more than 2,000 people. Late last month, a new report put the annual health costs caused by pollution from the Hunter Valley’s five coal-fired power stations and fine particle pollution from the region’s coal mines at more than $600million a year. Meanwhile, protests continue across the state, with activists continuing to block the forest clearance at the Maules Creek Mine, with more than 40 people arrested in the three week window the company has to clear the forest. 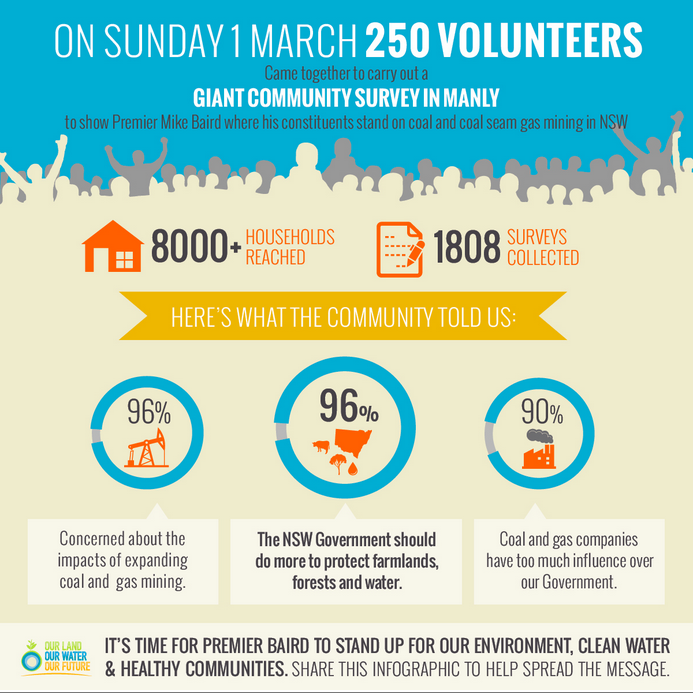 A GetUp survey in Manly has shown 96 percent opposition to the expansion of coal or GSG in NSW. Ahead of the March 28 elections, sensing the public opposition to Coal Seam Gas (GSC) exploration, the NSW Government is revoking exploration licences, but its move has been greeted with cyncismby many who say the revoked licenses are not for “active” areas with known resources. The Government’s “Gas Plan” includes a freeze on processing applications for new CSG exploration licenses, but the cancelled licences are largely not in areas with major CSG resources.The plan does not address areas with licences already in place where new gas exploration and production is actually threatened.The latest Government acquisition under its cancellations is a licence held by AGL, covering almost 400sqkm, including two electorates currently held by liberal MP’s who are not standing in the upcoming election after after allegations made at the Independent Commission Against Corruption inquiry into politician’s donations. Huge new coal plans are in train for New South Wales, with thousands of people having already pledged to fight Rio Tinto’s planned expansion of its Mount Thorley-Warkworth mine extension after the PAC recommended 350 residents in the nearby town of Bulga be relocated entirely. Meanwhile, an unpublished Office of Environment and Heritage assessment shows that 11 companies have plans by for 16 more coal mines in the the Hunter Valley, covering up to 45,000 ha of prime agricultural land, and have each paid $93,000 towards the assessment. The projects, if were to all go ahead, would increase NSW coal production by 60%. On the Central Coast, the PAC has given preliminary approved a proposal for the Wallarah 2 longwall coal mine at Wyong, also described as a “gamechanger” in the coming elections. Protests continue at Maules creek, where Whitehaven Coal is in the middle of a three-week forest clearing window to make way for a new mine. Meanwhile, a report by Climate and Health Alliance has released a report showing the annual costs of associated health damages from the five coal-fired power stations in the Hunter Valley at around $600 million a year. The burden of health damages on one town alone – Singleton – is estimated at $47 million a year from exposure to fine particles emitted from mines and coal-fired power stations.